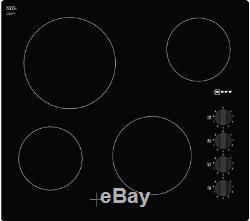 NEFF T16CK40X0 Electric Ceramic Hob - Black. Kitchen Appliances > Built-in Appliances > Built-in Electric hobs. Brand new & pristine product. Top features: - Fine-tune your cooking with nine-stage power adjustment per zone - Safer for your kitchen with residual heat indicators Fine-tune your cooking Cook the way you want to with the Neff T16CK40X0 Electric Ceramic Hob. It gives you more control with nine-stage power settings per cooking zone, so you can use intense heat to fry or broil, and medium or lower heat for gently simmering sauces, stews and more. Easily-accessible sword dials make it simple to adjust heat levels, and they're side-mounted so you can operate the hob without reaching across hot cooking surfaces. Safer for your kitchen The Neff T16CK40X0 helps keep your kitchen and family safer with residual heat indicators for each zone. When they're illuminated, you'll know that the hob is too hot to touch. Our expert installers may be able to install to a dedicated cooker circuit (identified by a big red cooker switch) if you do not have a 16 Amp supply in your home. All Currys/PC World Outlet guarantees are non-transferable. Type: Built-in electric ceramic hob. Hob power: Front right: 2 kW, Front left: 2 kW, Back right: 1.2 kW, Back left: 2.2 kW. Safety features: 2-stage residual heat indicator for each zone. Electrical installation: This product requires hardwiring to a 16 Amp fuse and should be installed by a qualified engineer, such as one of our Knowhow experts. Minimum distance required / Minimum clearance above hob: 650 mm. Box contents: Neff 16CK40X0 Electric Ceramic Hob. Dimensions: 46 x 592 x 522 mm (H x W x D). Boxed dimensions: 100 x 590 x 522 mm (H x W x D). This product has no reviews yet, however see what our buyers say about our other products.. We deliver within the UK only, this excludes the Republic of Ireland, the Scottish Highlands, Okrney and the Channel Islands. Warehouse/store pick-ups are not available. For more information, read on.. All days & time slots are subject to availability. We can install your new appliance on the day we deliver, for most of the UK. Remove & Recycle your old product. To save you the hassle we can take away and recycle your old appliance, along with any packaging when we deliver your new one. In the same condition as supplied to you - complete with any accessories and free gifts offered with it - if possible, with the original box and packaging. The above warranties do not cover non-faulty products, nor issues caused by accident, neglect, misuse or normal wear and tear. Please note - we do not stock spare parts, and are unable to send replacement parts. You received an incorrect item - you received a damaged item - you received a faulty item. Can a Currys or PC World retail store help? Reassuring 12 month guarantee on all products. The item "NEFF T16CK40X0 Electric Ceramic Hob Black" is in sale since Wednesday, June 28, 2017. This item is in the category "Home, Furniture & DIY\Appliances\Cookers, Ovens & Hobs\Hobs". The seller is "currys_pcworld" and is located in Newark.